As this year is the 40th anniversary of the “Out Of The Blue” tour or “The Big Night” as it was known in the United States. 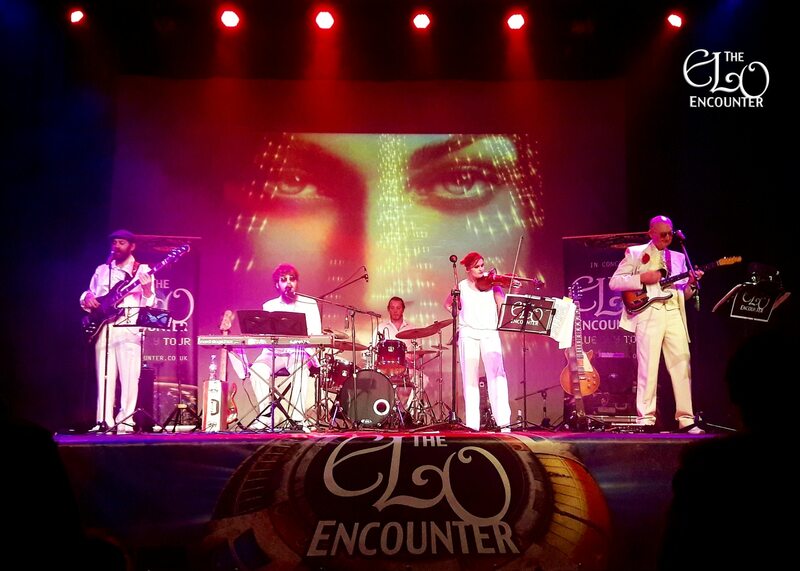 The ELO Encounter put on a spectacular show at the Witham Public Hall for a great audience who revelled in the renditions of songs by Jeff Lynne and ELO. It was held ‘in memory’ of the sudden passing of drummer Simon Dove a few weeks ago to the dreaded indiscriminate cancer. He will be sorely missed. Simon D and the band had worked hard to bring in five new songs for this years tour. With just a couple of weeks before the start, a new drummer by the name of Will was brought in at short notice to bridge the gap. I know Simon was looking forward to this years tour, unfortunately, that wasn’t to be but the show must go on. yesteryear and sang along to many as well as dancing in the aisles. “Out of This World” it certainly was. “Can’t Get It Out Of My Head”, “Ma-Ma-Ma Belle”, “Nightrider”, “Telephone Line”, “Don’t Bring Me Down”, *”Tightrope”, “Sweet Talkin’ Woman”, *”Four Little Diamonds”, “Do Ya”, “Rockaria”, “Hold On Tight”, “Rock ‘N’ Roll Is King”, “Roll Over Beethoven”, “Turn To Stone”, “The Diary Of Horace Wimp”, “Xanadu”, “Wild West Hero”, “All Over The World”, “Last Train To London”, “Shine A Little Love” and “Mr Blue Sky”. This is a must see show for all ELO fans everywhere. For a chance encounter, The ELO Encounter is superb and you will be assured a very warm welcome. Until the next time, thank you very much guy’s and gal’s for another wonderful trip down memory lane.